Jill Allen of Sweet Pete's with a Kona Wo. Fat bikes have found an audience this year and make a great winter bike. Sweet Pete's and their three stores around Toronto have been providing cyclists with some of the best selection in bikes for years. 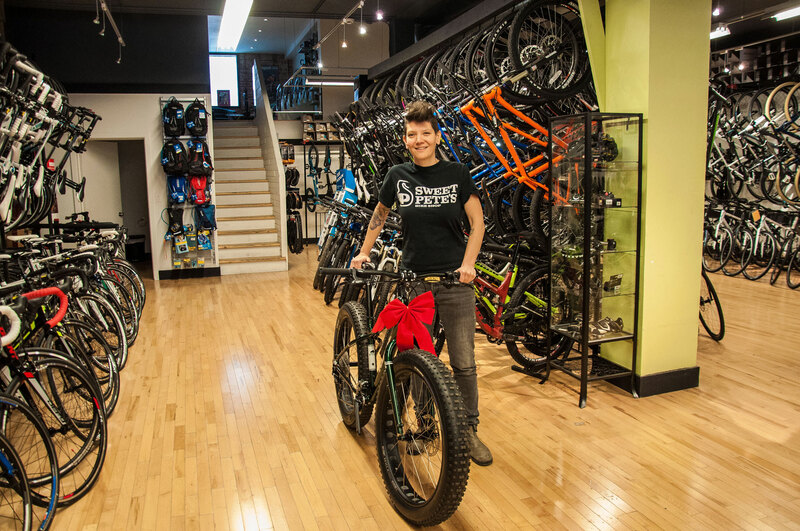 Jill Allen of Sweet Pete's showed off a Kona Wo fat bike at the Bloor West location of Sweet Pete's. Allen says fat bikes are selling out fast, but would be perfect in the snowy weather we can expect soon! As a part of our dandy winter cyclist series, we asked Jill Allen of Sweet Pete's what she wants #dandySANTA to bring her for the holidays. dandyhorse: If you could get a(nother) bike, what would it be and why? Do I have to choose just one? I suppose if I must, the next bike on my wish list would be a hard-tail mountain bike. It will serve double duty as the bike I can take to the new Sunny Side Dirt Jump Park with my 7 year old, as well as a way to hit the trails with all the folks from the shop! My hope is to get the Kona Honzo! Q: What bike lane(s) do you hope dandySANTA will bring for 2015? The entire city of Toronto needs a huge surge in protected bike lanes. The one that stands out the most to me is the whole stretch of College Street from High Park all the way to downtown. The cycle traffic that uses this as their cross-town commute is epic. Both drivers and cyclists alike are unable to operate efficiently and safely due to the lack of bike lanes on this stretch of roadway. Q: What bike gear do you hope dandySANTA puts in your stocking this year? My loving partner would argue that I do not need any more cycling gear, but I would beg to differ. I know #dandySANTA will understand. I would love the new Go Pro Hero 4 Black to be able to capture everything on and off the bike, and the new Bontrager Ion 700 USB light to light my way! Q: What else do you hope dandySANTA delivers this year? My wardrobe is simple. I live in my Blundstones. They just released a new colour and I'd love to add some variety to the one pair of shoes I always wear. Rustic Black Blundstones would make my feet uber happy and maybe even a bit fancy! Q: What is your number one tip for winter cycling? My best tip for winter cycling is to get good tires. Keeping the rubber side down is the name of the game. Better tires will have a better rubber compound. This helps to keep them rolling, instead of slipping out from underneath you. Also, when the snow starts to fly and gather on the roads, so does all of the debris. A very puncture resistant tire will make for a much more enjoyable commute. The last thing anyone wants to do is to fix a flat tire in the cold at the side of the road in the snow. Everything on the road gets plowed to the curb land, right where we ride our bikes. Spend the money and put good winter rubber on your bike. It will save you money and headache in the long run. I recommend a Bontrager AW1 Hardcase as an affordable option or the Schwalbe Marathon Supreme HS.